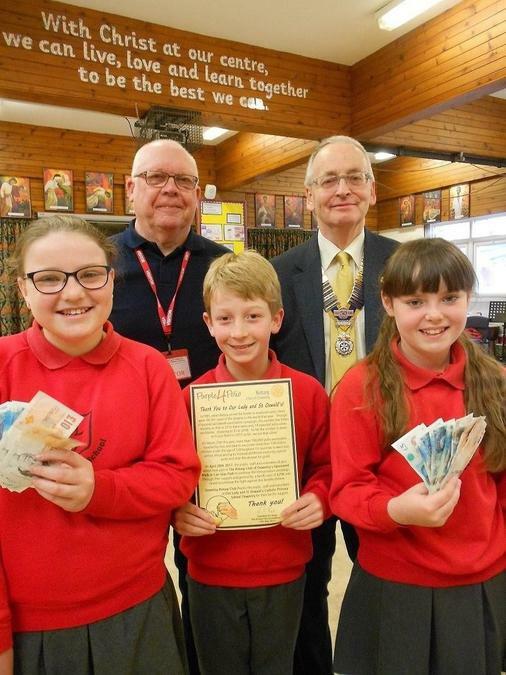 Ian Haigh, President of Oswestry Rotary Club and David Gordon, who organised this year's Crocus Walk, visited school assembly today to receive the £304.50 raised by our children and their families in aid of the Rotary Club's drive to end polio. Every £1 we raised will be matched by £2 from the Bill Gates Foundation, so our fundraising will generate over £900 and once Gift Aid is applied it will be even more. Mr Haigh explained to the children that this means at least 9,000 more children can receive the vaccine. In 1985 when Rotary joined the battle to eradicate polio, there were 39,361 cases worldwide, as a result of the targeted campaign last year only 36 cases were reported and to date this year the number is 5. However to ensure it is truly eradicated the vaccination program must continue. Mr Haigh and Mr Gordon presented school with a Certificate and thanked the children and their families for their terrific support.